The infantry community is desperately trying to push the word that Scales on War is a must read. A lot of infantrymen are shouting, “Buy it now!” For good reason, Scales on War argues bluntly that for many years, the infantry has been severely deprived its rightful slice of Defense Appropriations funding. To some extent, General Robert H. Scales, who began his thirty-five-year career as an Army artillery officer in the jungles of Vietnam, is right. The actual writing for this book began in a piece that General Scales wrote in a January 2015 article for The Atlantic entitled “Gun Trouble.” In the article, he explains that the legacy of a Civil War-era Union ordnance officer, General James Wolfe Ripley, who stonewalled the mass fielding of repeating rifles, still “haunts” the U.S. Army today in the form of bureaucrats, generals, and policy makers, who for a variety of self-serving or apathetic reasons have not adequately outfitted infantry units with the best and most effective rifles. This fact affects General Scales personally as he recalls witnessing several of his soldiers die in Vietnam while trying to clear jams from their M-16s. He then asks why these same M-16s are still being issued to soldiers and Marines almost 50 years later. Thus, his question throughout the book endures: Why is the infantry not given the proper resources and equipment that they need to be successful in combat? He asserts that the infantryman makes up a small fraction of the military population that is tasked with the role of “intimate killing.” According to Scales the number of mostly men involved in this task would not even fill FedEx stadium (where the Washington Redskins play). Yet these men do most of the fighting and dying, while being neglected DOD funding that might limit the latter. Why is this? Fair question. When you put it in those terms, it seems like a noble one too. However, there is something wrong in the construct of his thesis and in the entire premise of his book. General Scales has fallen into an erroneous trap in which he has failed to recognize distinctions between tactics and strategy. These two are linked to be sure, but he never fully appreciates the nature in which bad strategy can set up the infantry for failure tactically. Therefore, while I agree with him about the need for better training and equipment, and while I can gladly support the argument that infantry units should have updated rifles and dedicated drone assets, I cannot endorse the premise that winning battles automatically means winning the war itself. Nor can I forgive policymakers for making strategic errors that ultimately put the infantryman in unwinnable situations. This is where Scales and I differ. Not fielding updated rifles is not a strategic error, it is a logistical one. Strategic errors are much greater than the fielding of rifles. They involve decisions about when, where, why, and how a war will be fought. That question alone should begin the conversation about what weapons should then be sourced. But, that question is never brought up in this book. Nevertheless, Scales begins the book by referencing the medal of honor ceremonies of Staff Sergeant Salvatore Giunta and Captain William Swenson, both of whom were awarded these honors for heroism in Afghanistan. Scales seems to believe that due to some Washington beltway scheme misappropriating funds to non-infantry segments of the military (i.e. planes and ships), these two brave men were neglectfully put into positions where they were fighting what he calls “fair fights” with the enemy. When he says that the fights were “too fair,” his argument is that these infantrymen were not given the tools and resources that might have given them an edge over the enemy, which in this case was the Taliban. Again, Scales might have somewhat of a valid point. I do not disagree that it would have been beneficial for their units to have a Reaper or Predator feed from a UAS flying high above them. However, even General Stanley McChrystal as JSOC commander in Iraq from 2003-2008 fought bitterly to get more UAS assets in Iraq while his Task Force was on the hunt for Zarqawi. Think about that for a second, the JSOC commander was having his own task force piece together old airplane parts to make more drones while going after the most notorious terrorist in Iraq. The need for more drones is evident, and Scales is hardly the first person to clamor for them. Welcome to the world of inter-service battles for more money and greater cooperation. It’s a tough, hard fight, and one that won’t go away anytime soon. Back to the soldiers in Afghanistan, even if they had flown drones and had the ability to see their enemy first, this does not mean that winning any one of those battles specifically would have ensured success in the war overall. Scales doesn’t even ask the most obvious question: Why were they there in the first place? Second, were policy makers fully committed to the strategy in Afghanistan? Strategy matters. Wars can still be won despite tactical mistakes. Conversely, soldiers and Marines can still win battles and lose wars. A strategic blunder cripples the mission from the start. Indeed, there have been multiple occasions in which military operations have been conducted with overwhelming success and yet wars have been lost or nearly lost due to poor strategic planning. For example, the first Gulf War saw the removal of Saddam from Kuwait, but he remained in power in Baghdad where he reconstituted his Republican Guard and ultimately continued to terrorize his own people for the next decade. Additionally, the 2003 invasion of Iraq and toppling of Saddam was a huge tactical and operational success, but with no clear guidance and plan for the end of the war, many American troops and Iraqi civilians were killed in the destabilized society and sectarian violence that followed. More importantly, I would argue that the decision to go to war in Iraq in March 2003 vastly hurt the strategy to go after Al-Qaeda and remove the Taliban from Afghanistan. By opening a second front in the war on terror and choosing to fight in Iraq, a disproportionate number of troops, money, and supplies were diverted from the conflict in Afghanistan to the war in Iraq. This was a strategic decision, and in hindsight it was not a good one. Thus, to say that SSgt Giunta and Capt. Swenson were the victims of funding that was diverted from the infantry to planes and ships is to miss the point of strategic missteps that diverted those funds to an entirely new conflict. If drones hadn’t been flying on the hunt for Zarqawi, perhaps they could have been flying in the hunt for Taliban fighters. The fact of the matter is that the U.S. military has been flush with cash since the start of the war on terror. We are now approaching year sixteen of the war in Afghanistan, yet neither the Republican or Democratic presidential candidates talked about it in the most recent campaign cycle. This war was mentioned in none of the presidential debates. The American people could conceivably live their daily lives in sheer oblivion to what is going on in what is now the longest war in U.S. history. And yet Scales never seems to take any issues with that fact. He has a host of unnamed, nefarious Beltway enemies that he points to. But, these Beltway demons are red herrings. The real problem that gets infantrymen killed is simple: Top-level strategists have not done a good enough job. I don’t think that they have an insidious agenda (other than votes). Nor do I believe they are “bad” people. I just don’t think they have done a good enough job. On that note, I will repeat my point that decisions about what rifles to invest in are not strategic decisions. Decisions about putting GoPro cameras on soldiers are not strategic decisions. However, decisions about what wars to fight are strategic decisions. This difference needs to be understood clearly because this is where lives are seriously affected. We could give every soldier and Marine an iPad, GoPro, small drone, and top shelf hunting rifle, but it doesn’t matter if policy makers aren’t committed to their strategic success. One might argue that these resources reflect that commitment, but that is simply not the case at all. The best trained and best resourced militaries in the world can still be defeated due to poor strategy. Finally, Scales argues that the goal of the enemy has always been to kill as many Americans as possible to sway public opinion. He cites a Japanese Colonel named Yahara, who at the Battle of Okinawa devised this strategy: Killing Americans. Scales calls the “killing Americans” strategy our critical vulnerability. No kidding. On this point though I think he and most people are mistaken in the belief that Americans don’t have the will to fight a long, protracted conflict. It is worth noting that Americans can endure war and the hardships of it when they know the cause is right. American leadership needs to be straightforward about the strategy and the reasoning behind it. There is an element of trust that must exist between the public and the policymakers. Too often people forget that the Pentagon Papers did as much damage as the media’s coverage of the Tet Offensive. Why? Because Americans lost trust in their leadership. With the Iraq war, Americans lost trust in the Bush administration when no weapons of mass destruction were discovered. Despite this revelation, Bush was still re-elected in 2004 and the surge strategy was still approved nearly four years into a war that appeared nearly lost. On the other hand, Afghanistan has always been viewed as the right war. The Taliban gave refuge to Osama bin Laden, which meant that the Taliban had to go. Now over fifteen years later, the war continues and there are very few protests or calls to withdraw the remainder of our troops from that country. In the meantime, the Americans who have fought there, have been left underfunded and without the necessary support to fight the Taliban while a second war was started in Iraq. None of this factors into Scales analysis of how SSgt Giunta and Capt Swenson were set up for failure. 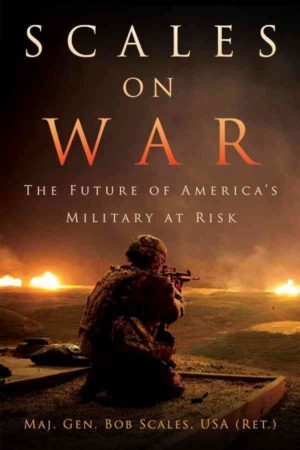 Overall, Scales on War is worth reading because any book that seriously analyzes the past, present, and future of the U.S. military in a thoughtful way is worth reading. While I don’t support the authors premise and I shake my head at his failure to see the distinction between tactics, operations, and strategy, I commend him for his outside the box thinking about the infantry. I commend him for his passion to fight to improve the quality of our military and our infantry. I commend him for opening a dialogue about the future of the infantry. General Scales deserves a lot of credit for what he has done with this book. My only hope is that people will read it critically and apply Scales’ level of open minded thinking to the provocative points that he has brought up.